Traveling to Narita by ANA. 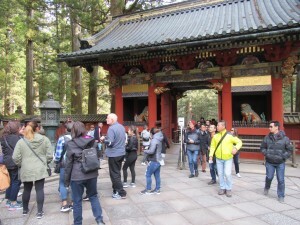 Everyone was on time and so excited to go to Japan. Our fight time was about 9 hours. We all enjoyed watching many movies. When we landed in Narita, the weather was cloudy but wasn’t too cold. We arrived at Grand Nikko Tokyo Daiba around 3:40pm, little earlier than scheduled. We all liked our nice hotel rooms. 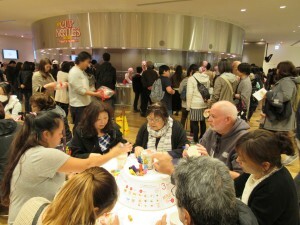 We checked in our rooms and we got back together at 5pm for Odaiba strolling. 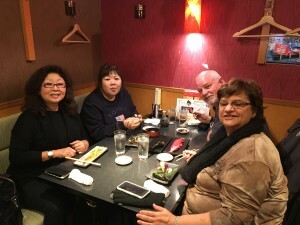 We went to Aqua City and we had great dinner on our own. 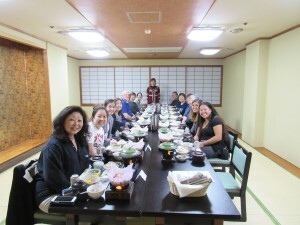 We all enjoyed our breakfast buffet on the 30th floor with gorgeous Tokyo view. Unfortunately it was raining and the temperature was about 40°F. 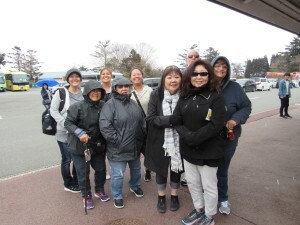 It was a cold morning but everyone was ready for Disney Sea. 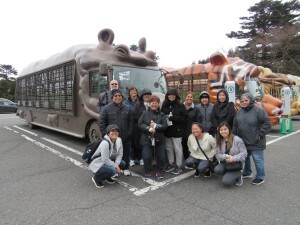 Our guide and bus came to pick us up on time and left for Disney Sea at 8:30am. It only took us less than 30 minutes. We made sure that we meet at the gate for shuttle bus pickup. 3 people signed up for 8:40pm shuttle and rest of the group changed shuttle pick up time to 10:20pm. Many of them didn’t want to miss the night electrical parade. Everyone came back to hotel as scheduled. 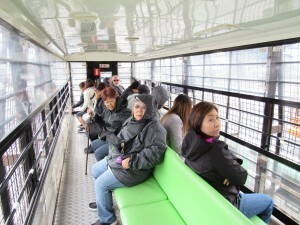 Despite the bad weather, everyone really enjoyed the rides, shops, and food. It was an early departure for Yokohama sightseeing. We are so good on time and everybody is always on time! 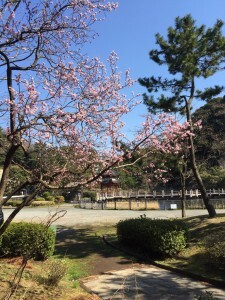 We left hotel at 8am with English Speaking Guide, Joy Yamamoto for Sankeien Garden in Yokohama hoping to see some cherry blossoms. It was a nice day but temperature was still low for this time of year. 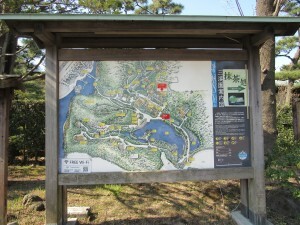 Sankeien is a very historical place and it is about 43 acres. 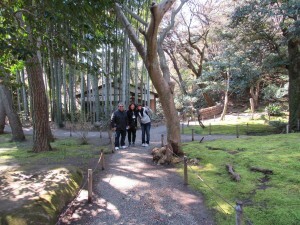 We walked among in the inner garden and enjoyed taking photos of Japanese garden, buildings, and trees. 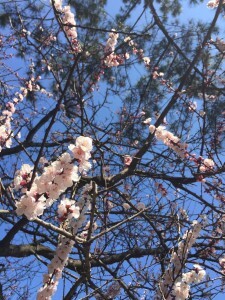 It was too late for plum blossoms and little too early for cherry blossoms. 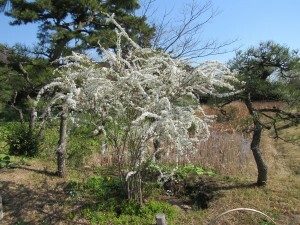 However, Some were blooming at the south gate. 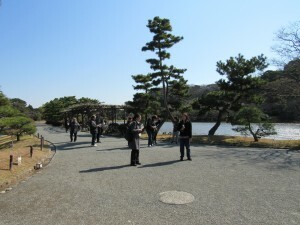 Everybody really liked moon viewing point. 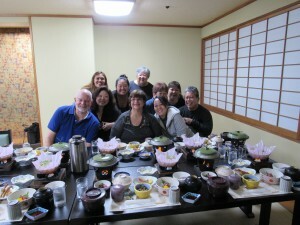 Nobody had ever tried Japanese tea ceremony so we decided to do so. It was a fun challenge – at least we didn’t have to sit on the floor. 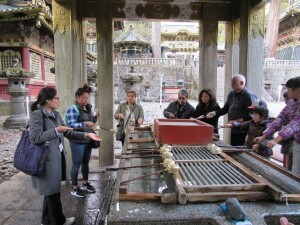 We learned how to eat sweets before green tea and how to drink green tea the proper way. Green tea wasn’t as bitter as we expected. 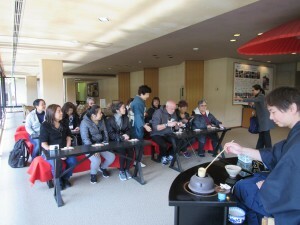 Everyone relaxed and enjoyed tea ceremony. 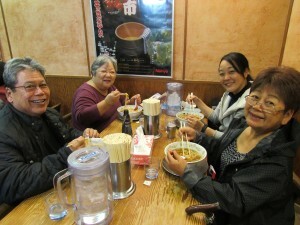 After beautiful Sankeien, we headed to Shin Yokohama Ramen Museum where we had lunch. 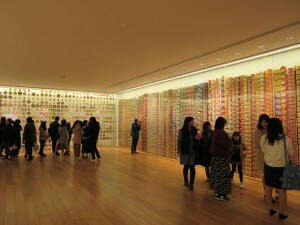 There were 9 different ramen shops from all over Japan at the museum. We walked together and tried to find which ramen each person likes. 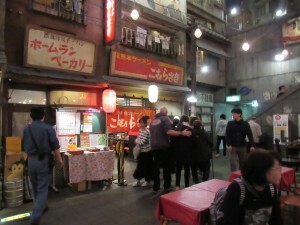 Then we spread apart to find each person’s favorite ramen shops. 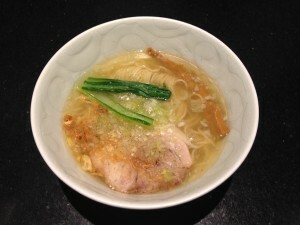 I tried shio ramen (salt) at Shinasoba-ya. 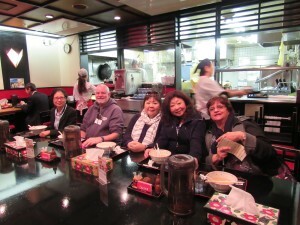 Ramen was good and everyone enjoyed their ramen. 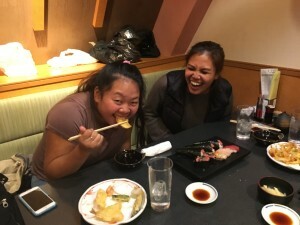 Two girls even tried 2 different ramen. I wish I could eat more than one. 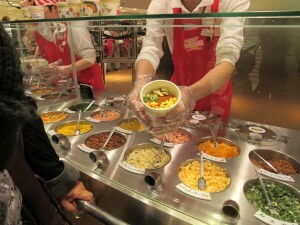 We shopped and left for Nisshin Cupnoodles museum. 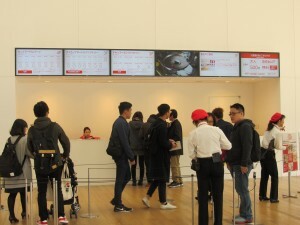 We arrived Nisshin Cupnoodles museum on time. 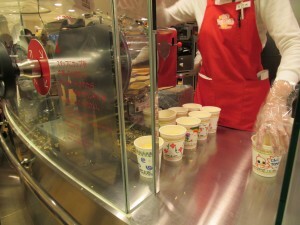 We were there for to make our own cup noodles. First we had to draw something on the outside of package. 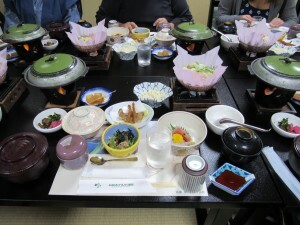 And we can choose soups from 4 kinds. Then we can pick 4 ingredients to put in. After that they sealed the package for us. 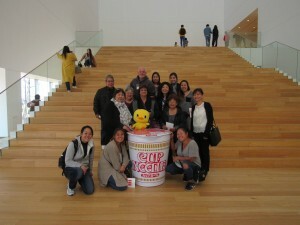 Yes, we made our one and only own cup noodles to take back. Nisshin cupnoodles were invented by Momofuku Ando back in 1970’s. 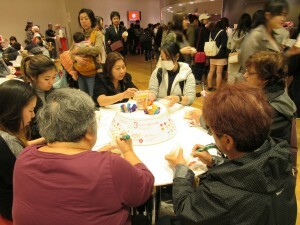 The exhibit of Nisshin instant noodles history cube was also interesting. 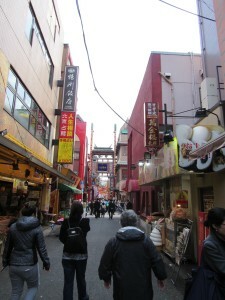 Then we headed to Yokohama China Town. 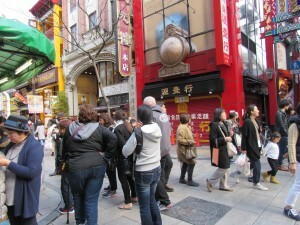 We had about 2 hours in China Town which the biggest China town in Japan. 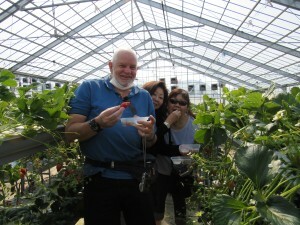 We strolled around and enjoyed the atmosphere and food. 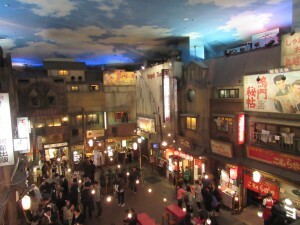 After China Town, we headed back to Daiba hotel. It was a full fun day with beautiful weather. 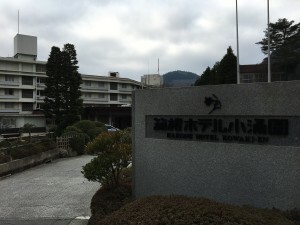 We had checked out of our hotel for an over night trip to Hakone. 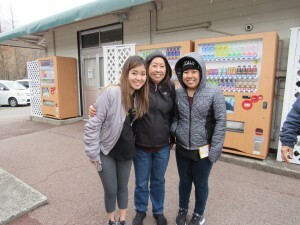 We left our hotel at 9am and headed to Hakone. 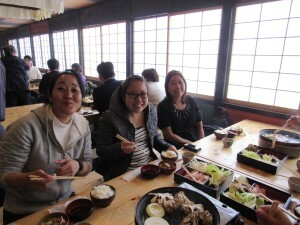 We had buffet lunch at Hakone Kowakien and had little entertainment. 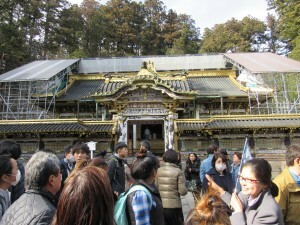 Japanese TV crews were there for filming. We couldn’t go out of lunch place for a while. 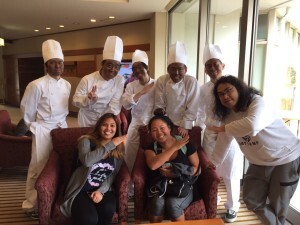 We were watching buffet line then some Japanese comedians came out and did some show. We were able to take photos with those comedians for our great memory. 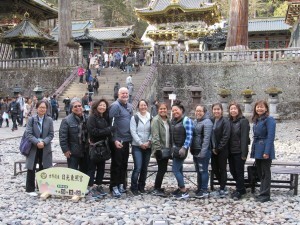 After lunch, we went to Yunnesun Spa Resort where visitors can bathe in hot springs with swimming suits filled with popular beverages such as red wine, sake and coffee. It was much fun for all ages. 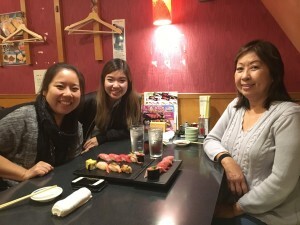 We tried Dr. fish for the first time. It was an experience you would never imagine. 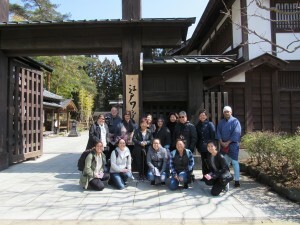 We all enjoyed different onsen and went to our hotel – Hakone Kowakien – to check in around 5pm. 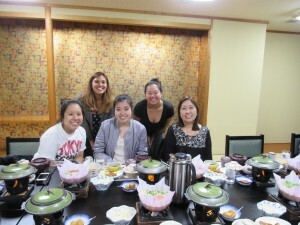 We had great Japanese dinner at 6pm together. 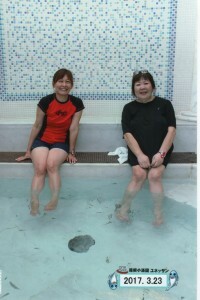 I, myself enjoyed Onsen at Kowakien hotel, too. 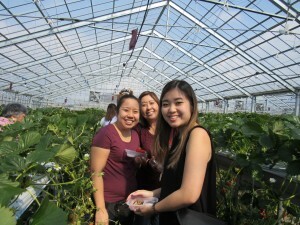 We left for Fruit picking – Strawberry picking at 9am. 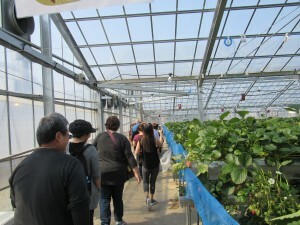 It only took about 45 minutes to Izu Fruit Park. 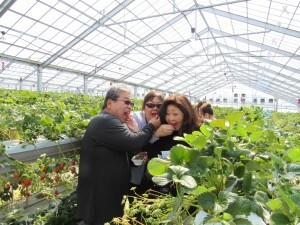 Their strawberries were so fresh and so sweet. 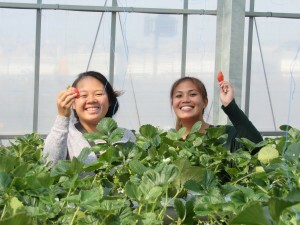 Everyone enjoyed picking and eating strawberries for about 30 minutes. 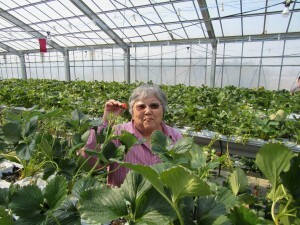 One person ate about 120 strawberries! 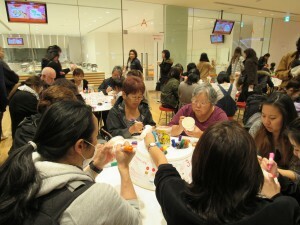 We also enjoyed omiyage shopping, too. We had enough time to spend at shop so we all loved it! 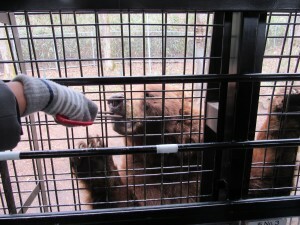 We headed to Fuji Safari Park and arrived there at 11:35am. Surprisingly It started snowing! Some of us have never seen falling snow so it was great gift we had received! We got on hippo bus for going in the safari park. 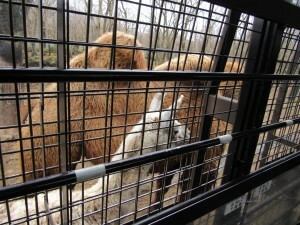 We could feed bears, lions, and camels from our bus. It was quite an experience going through the park in snow. 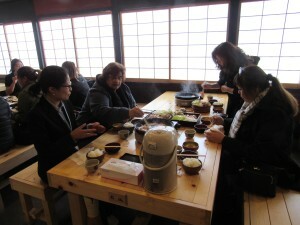 Despite seeing snow, it was so nice to have lunch in warm restaurant. 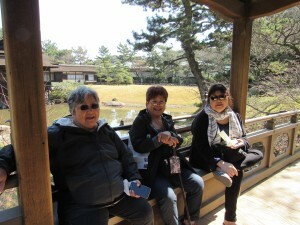 After some more shopping, we headed back to Grand Nikko Tokyo Daiba. 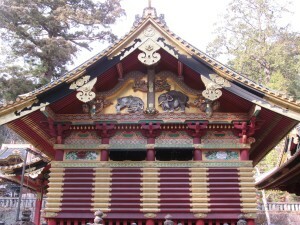 It was a very nice day for Nikko. We left hotel at 8am and it took about 3 hours to get there. 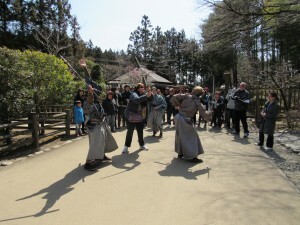 Edo Wonder Land is the only place to experience the living history and culture of Edo period Japan. 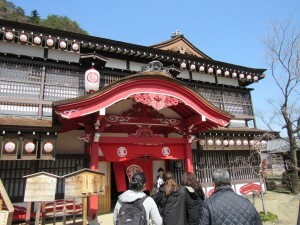 When we entered, samurai warrier was waiting for us. One of us had to fight with sword. 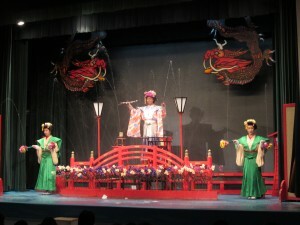 We had to hurry to catch oiran (star geisha) show. 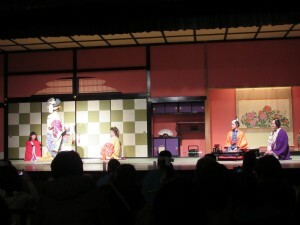 The show was good and we were able to try to throw our money (ohineri) to the stage. 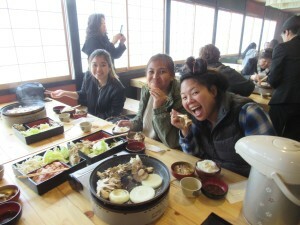 We had barbeque lunch – cook our own. And we were able to see water magic show. 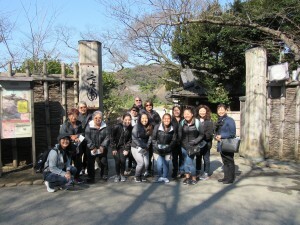 Then some of us tried to go through Ninja House! It was full of performances and entertainments. 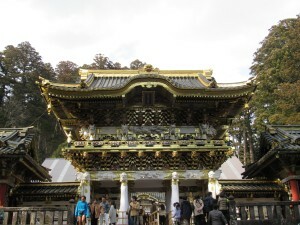 We had to leave for Nikko Toshogu Shrine after 3 hours of stay. 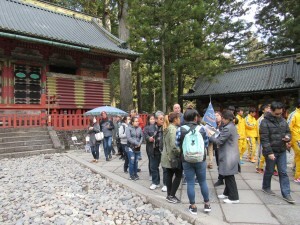 Toshogu Shrine is the world heritage site and dedicated to Ieyasu Tokugawa who was the founder of the Tokugawa Shogun era. 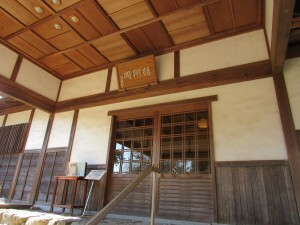 It was originally built in 1617. 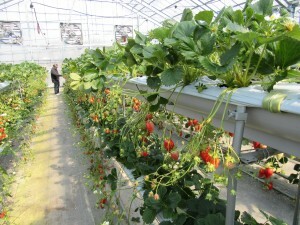 55 building are on the site and those were finished building within 18 months. 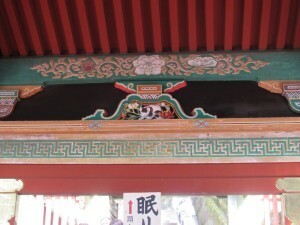 Yomeimon, a gate with splendid carvings , rich color painting and decoration was just finished its renovation. 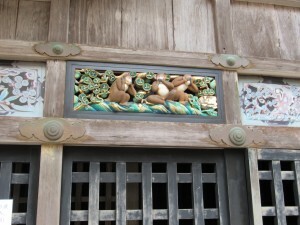 Also restoration of sleeping cat (Nemurineko) by Jingoro Hidari was just completed so we were able to see the real one. This sleeping cat is also the national treasure. 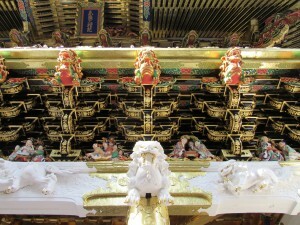 We walked through Higashi Ginza and Kabukiza, and arrived at Ginza Mitsukoshi Department. We spread out and enjoyed shopping for one hour and half. 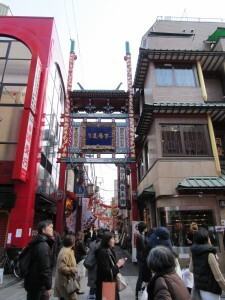 Some went to GU, Uniqlo, Kimura-ya, Ito-ya and Mitsukoshi department store. There were no cars around Ginza 4 chome because of Sunday (Hokosha Tengoku). But it was still raining. Then we walked to Yurakucho for Tokyu Hands. We were able to shop for while, too. After Tokyu Hands, we took Yamanote Line to Harajuku. 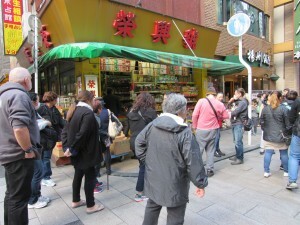 Everyone wanted to see Harajuku Takeshita Dori and big Daiso store. 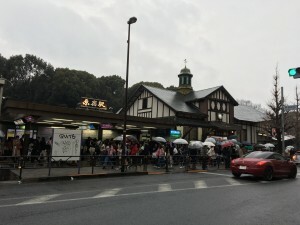 Despite of raining, cold Sunday, there were so many people on Takeshita Dori. 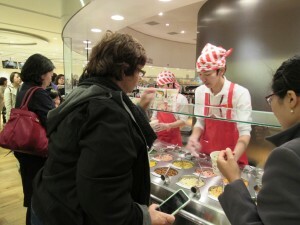 We enjoyed shopping, watching people and eating crepes! Everyone did great in that bad weather. 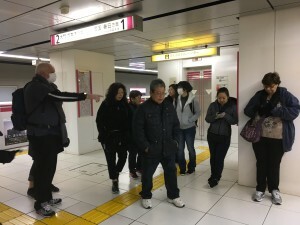 So we got together at Harajuku Station at 5pm. Everyone was on time and I didn’t lose anyone. We were so proud of ourselves! 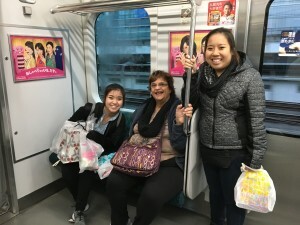 We all headed back to Daiba. 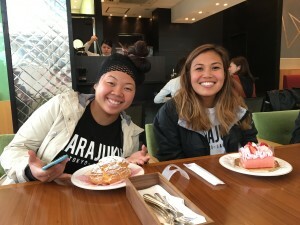 We will see Shibuya, Akihabara, Asakusa next time! Finally, it was the day we have to go back home. 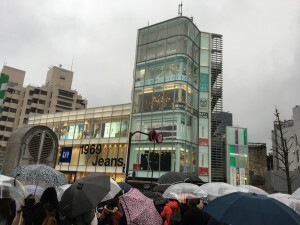 It was another rainy day but we had more to shop! 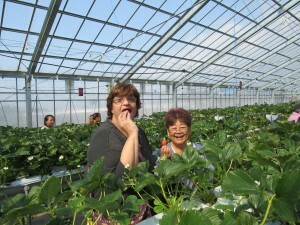 Makuhari Aeon is only 30 minutes away from our hotel and on the way to Narita Airport. It was little short for the huge mall but everyone handled so well. 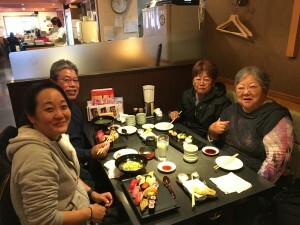 4 of us went to Costco Japan and enjoyed shopping! 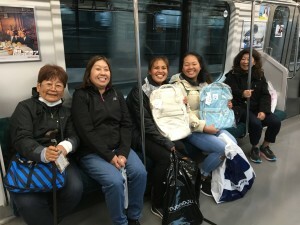 At last, we arrived at Narita Airport, we had to repack our luggage but we were on time and had some shopping time at airport! 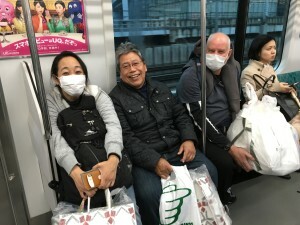 I really do hope everyone on this tour enjoyed staying in Japan. Also I do appreciate your warm hearts and hospitality. We hope to see you all on our future trip to Japan. 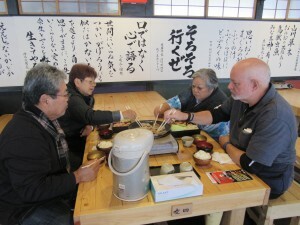 "The best breakfast in Japan" is ready for you at Kayotei.